If you use a custom SQL Server backup task with the full backup model (instead of the built-in Backup task for Configuration Manager), the upgrade can change your your backup model from full to simple. As for Cumulative Updates, it doesn’t matter what version you have installed. IMPORTANT! With ConfigMgr 1511, support for running your Site server on Windows Server 2008 R2 or running the Site database on SQL Server 2008 R2 will most likely be unsupported (or deprecated) within 12 months from the release of this new version. If you’re still using any of these products in your hierarchy, I’d strongly suggest that you look into performing a side-by-side migration instead of upgrading your current hierarchy to ConfigMgr 1511. This is because it’s not supported to do an in-place upgrade of Windows Server 2008 R2 to Windows Server 2012 R2 when running ConfigMgr on that server. Steve’s blog post is about setting up backup using SQL Server instead of the built in Maintenance Task in ConfigMgr. Whichever method works just fine, but I’d recommend that you look at switching to performing a backup with SQL Server from now on, if you’re currently using the built in mechanism, since the SQL Server backup can leverage compression that saves you disk space, and at times is much faster. When you’ve prepared your environment, backed up the database(s) and verified that everything is in order, you can now go ahead and perform the upgrade starting with the top-level Site in your hierarchy. Below is a step-by-step guide that takes you through the upgrade wizard. The process is almost the same for a CAS, Primary Sites and a bit shorter for Secondary Sites. 1. Launch splash.hta elevated as a Full Administrator user in ConfigMgr (you’d also need sysadmin permissions on your SQL Server). 4. 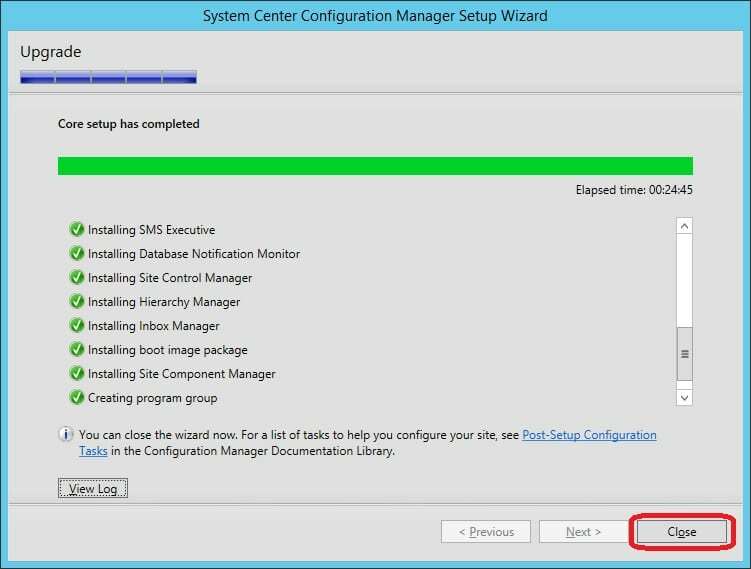 On the Getting Started page, make sure that Upgrade this Configuration Manager site is selected and click Next. 6. Accept the prerequisite license terms and click Next. 7. Click Browse on the Prerequisite Downloads page and choose a folder where the files will be stored, e.g. E:\Installation\ConfigMgr_1511\Prereqs. Click Next. 8. Wait for the prerequisite files to be downloaded. 9. On the Server Language Selection page, your previous configuration of languages is shown and it can not be changed since this is an upgrade. Click Next. 10. As for the Client Language Selection page, simply click Next. 11. On the Usage Data page, click Next. 12. Click Next on the Settings Summary page. 13. Setup will now launch the prerequisite checker which displays any errors or warnings that you may have to remediate before you continue with the upgrade. Wait for the process to finish. As a note here, any errors during this check will cause setup not to continue. Warnings may present valuable information that could potentially bring problems in the future. I’d recommend that you remediate any errors or warnings shown in this step before you continue with the upgrade (In my lab environment I’ve not configured enough memory for my SQL Server, but that’s not something I’d recommended in a production environment). 14. Once the prerequisite checker has finished, assuming that everything was in order, click Begin Install. 15. If you’d like to see a detailed view of the actual upgrade process, click on the View Log button to open C:\ConfigMgrSetup.log. Now that the top-level Site in your hiearchy is upgraded, make sure that you verify that everything is working as expected and then continue on with the next Site in line. If you’re running a stand-alone Primary Site server, you can move on to the verification part of this post. On your Site server check the value called Full Version, found under HKLM\Software\Microsoft\SMS\Setup. It should read 5.00.8325.1000. In addition to the Full Version value, the CULevel should now be set to 0. 1. Launch the ConfigMgr console. 2. Go to Administration – Site Configuration – Sites, right-click on your site and choose Properties. To enable this feature, go to Administration – Site Configuration and select Sites. Click on Hierarchy Settings and go to the Client Upgrade tab. I highly recommend that you make use if this feature, unless that you want to create your own custom Client Upgrade Package specifying the necessary parameters for ccmsetup.exe which are required in your environment. If you choose to use Client Upgrade feature, remember to not set the Automatically upgrade clients within days value to low, as it might cause an extra load on your Site servers when too many clients are trying to upgrade at the same time. If you for instance set the value to 2, all of your clients with a lower build number than the Site that it’s assigned to will retrieve the policy and create a local scheduled task to run within a randomized time frame between within 2 days. A new feature with ConfigMgr 1511 is the option to select a Pre-production collection. I’d suggest that you create a collection and add some systems into that collection. Select this newly created collection by hitting Browse. Configuring the Pre-production collection at this time, will allow for piloting of the client upgrade when the next release of ConfigMgr is available. This is a really nice feature that will assist in making sure that the client upgrades are successful in the future. Also remember that if you choose to create your own Client Upgrade package, ccmsetup.exe will automatically detect whether the Operating System architecture is 32-bit or 64-bit, so there’s no need to create collections that contains architecture specific clients. select SMS_R_System.ResourceId, SMS_R_System.ResourceType, SMS_R_System.Name, SMS_R_System.SMSUniqueIdentifier, SMS_R_System.ResourceDomainORWorkgroup, SMS_R_System.Client from  SMS_R_System where SMS_R_System.Client is not null  and SMS_R_System.ClientVersion = "5.00.8325.1000"
I hope your upgrade goes well, and let me know if you have any questions! great article thanks for this! Support for using SQL 2008r2 is not ending within 12 months, according to the page you linked to, though it is listed as deprecated so I expect that it probably will stop being supported within a couple of years. Other than that, great post, and I look forward to following it soon to upgrade my own environment! I’ll update the post so that I’m not confusing anybody. I’d say, although it might not be unsupported directly, even though I think that’s the way forward if you’d look the Windows as a service releases support periods. But nothing here has been written in stone yet, it’s my qualified guess and I wanted to highlight it. AE, this is the full RTM release. Do you see somethings in Windows 10 Servicing / All Windows 10 Updates ? In the upgrade path section your write about the minimum version of ConfigMgr to be installed in order to upgrade to ConfigMgr (CB). Microsoft states different, maybe your information was bases on earlier/older information? Yes, as of matter of fact it’s very wrong. I’ve updated the section accordingly with the documentation on TechNet. Thanks for pointing that out! Now the below scenario is also supported as per the same guid? I installed the hotfix on WSUS, and I can see them there and approve them, but it doesn’t pull into SCCM. Am I doing something wrong? I setup a Servicing Plan, but nothing shows up. I have the following situations, I am using at the time windows 2008 R2 , SQL 2008 R2, sccm 2012 R2 SP1 CU2. Have I to install the sccm 2012 R2 SP1 on my new machine again? I thing I dont need to do that? What do you mean? Thanks to your guide I was able to do an in-place upgrade from ConfigMgr 2012 SP1 to 1511 succesfully at a customer. It saved me a lot of time, I didn’t have to gather all the info on TechNet etc. Hi, we’re going from SCCM 2012 R2 CU5 to SCCM 1511. We are on SQL 2012 Standard, and we would like to go to SQL 2014 Standard. Should we proceed with the SQL upgrade first or after the SCCM upgrade? as per https://technet.microsoft.com/en-us/library/jj865691.aspx or similar articles. At what point do I have to upgrade the client on all my workstations? Can I leave the client at the ConfigMgr 2012 R2 level (5.00.7958.1000) until I have the server at ConfigMgr Version 1602, and then send out an update client command? I would like to do this in a day or over weekend and not have to worry about the clients until done. Will the “old” clients talk to an updated server with out issues? I understand new features would not be enabled, but would all old features still be active? Regarding you clients, they will continue to operate. However, you should not expect any of the new functionality that come with ConfigMgr 1602 to work on your ConfigMgr 2012 R2 clients. 1. 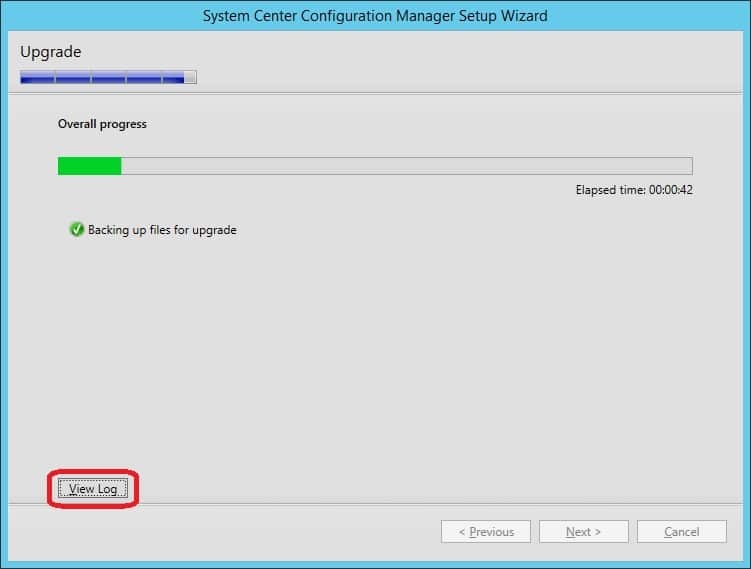 Perform a testdb upgrade of your ConfigMgr 2012 R2 database. 3. Run an in-place upgrade to ConfigMgr 1511. 4. Enable the pre-production client deployment option under Administration -> Sites -> Hierarchy Settings -> Client Upgrade. 5. Upgrade to ConfigMgr 1602 using the Updates and servicing node in the console. 6. Configure the pre-production client deployment to target a device collection containing a couple of systems (this will immediately deploy the latest version of the ConfigMgr client to those systems). 7. When the pre-production client deployment have successfully been verified that they’re all working, stage the latest ConfigMgr client version into production. Thanks for the quick reply. That sounds like what I was hoping for on the clients. And the confirmation of just having 2 upgrades versus 3 is great. For the upgrade test of the database, it mentions that the SQL server you test it on needs to be the exact same version. Articles from others just mention same edition. These both appear to be SQL Server 2012 SP2, but on slightly different patch levels. Will this work for the test? What do you recommend for the console updating? I would also like to avoid updating them twice, once for each upgrade. We have successfully upgraded to SCCM 1511, but we are, so far, unable to take advantage of the Automatic client upgrade feature. When on that tab, the “Upgrade all clients in the hierarchy using production client” and “Do not upgrade servers” are greyed out, so we’re unable to check them…. Production client version listed at 5.00.8325.1000 and modified 5/6/2016. Thoughts on why we are unable to access this function? As far as i know with the release of 1602 version it is supported in-place upgrade from server 2008R2 to 2012R2 and SQL upgrade as well. Note that this upgrade requires .NET 4.5.2 to be installed on client machines. If not already deployed this can cause Client Deployment to request a non mandatory reboot. Users may receive reboot notifications on their machines. This is pretty thorough, but without an MSDN subscription where can you actually get the software from? You should be able to find the installation media from VLSC. I’ve since been told that unless you have Software Assurance, this software is not freely available. It’s a version upgrade that requires a payment, as opposed to a patch or service pack that doesn’t.